Diaphragm Valves have been designed to handle corrosive/Hazardous media, fibers media as well as water, air, normal fluids, gases and slurries. Diaphragm Valves both W.O. (Wear Orifice) type. Allines range of superior design and major cost saving benefits, for Secure and full leak tight operation, minimum pressure losses under The most severe circumstances. The bodies and bonnets are made from high grade cast-iron and is suitable for Various rubber lining compound. The bonnet assembly consists of the bonnet shell, spindle, spindle Nut, compressor and handwheel. The Diaphragm is moulded with reinforced flexible material and Can be made from a wide range of base materials for different applications. 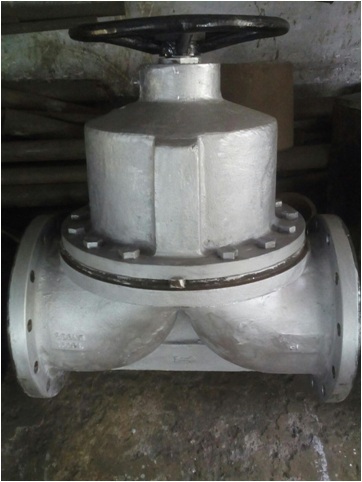 Due to versatile design the replacement of a Diaphragm is possible without Disturbing pipeline, which saves valuable time. Full rubber on flange faces to avoid gasket need for installation. Diaphragm Valves are used for on / off or throttling services in chemical, Petrochemicals, Fertilizers, paper & pulp, rayon, power plants, efficient treatment plants, Nuclear and other industries. Hydro Testing PN-10 (DN 15 – 100), PN-6 (DN 125- 150), PN-4 (DN 200 – 300).